Gerbera daisies (Gerbera jamesonii) are often cultivated as "pot crops" or flowers grown in containers and sold as gift flowers in supermarkets and floral shops. Outdoors, however, these bright beauties, native to South America, thrive as bedding plants. Gerberas can be grown as annuals or perennials, depending on the climate--they cannot tolerate freezing temperatures--and are highly desirable for their large, brightly colored flowers that can last up to two weeks. Choose a location for your gerbera with full sun or partial shade. If you have hot summers, plant the flower where it will receive some filtered afternoon shade. Home gardeners in climates with mild summers can plant the flower in full sun. Make sure the soil is well-draining. Do not plant your gerbera where standing water collects or in a depression. 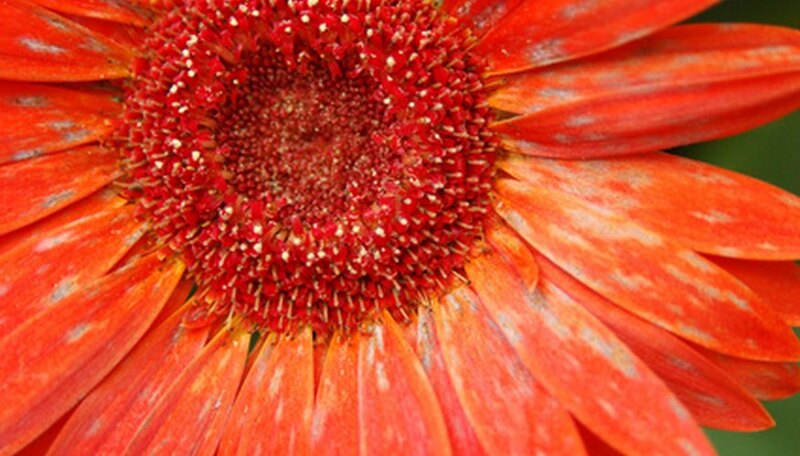 Gerberas like loose soil rich in nutrients, according to the University of Florida. Amend poor soil with organic compost and peat moss to improve drainage and increase the soil's nutrient value. Water when the top of the soil feels dry to the touch. Gerbera daisies like the soil to be barely moist. Do not let the soil dry out completely or become overly wet. The latter can lead to the development of fungi, such as the fungus that causes root rot. Soaked soil can also lead to gray mold, which covers the leaves of the plant when it becomes infected. Feed your outdoor gerbera daisies often as the flowers are heavy feeders and thrive with sufficient food. Choose a slow-release fertilizer rich in iron. Feed the daisies in early spring directly after planting, again in mid-summer and finally at the end of the summer. Apply the food according to directions on the label for the size of your gerbera plant. Clip off the flowers after they have faded to encourage re-blooming. You can also cut them for use in a vase, as gerbera daisies last a long time in water.